When I was in fifth grade at St. Clare's, the rule in Reading class was that you had to check out a book from the school library once a week. By October I was complaining to my mother that I had read every book worth reading in the small, one-room library. Donna was, and still is, a voracious reader. So rather than argue, she took me to the family room where the shelves of her library flanked our brick fireplace. I couldn't reach any of them — at least not without climbing — so the thought never occurred to me that I might actually want to read any of them. Although somewhere in the back of my mind also lurked the thought that the higher up the books were on the shelf, the more “inappropriate” the were for “young readers.” So naturally I was delighted when she reached for a slim book in a teal dust jacket from the second highest shelf. “This must be the good stuff,” I thought, never wondering for a moment why my mom would freely hand over the good stuff to me — whatever that “good stuff” might be. “If you like this, there's a whole series you can read,” she said handing me Casino Royale by Ian Fleming. “But you have to read them in order, and this is the first.” And so began my literary acquaintance with James Bond, 007. I simply couldn't put the book down — which pleased my mother to no end, but caused all kinds of grief in Sister Margaret Mary's English class where students were never supposed to be without a book. (So when they finished all their other work, they had something to keep them out of trouble — back in the day when reading was presented as a reward, and not a form of punishment). I had just finished the certain-to-be-useful-in-the-real-world-exercise of diagraming a dozen sentences, put down my pen, and cracked open my Bond book when a bony hand covered in liver spots yanked the book from my hands and slammed it shut on the desktop in front of me. “Oh yes, sister” I responded. “We'll see about that, you bold and brazen thing,” the nun said, not believing a single word. Next she grabbed both me and the book and marched the two of us down the hall to the office of Sister Mary Alice, the school principal. From the office, my tormentor called home. “Of course,” my mother responded. Refusing to rise to the same level of hysterics. ​“Of course,” my mother responded calmly, pausing for a second before delivering the punch line, “I was the one who got it down off the shelf for him.” Go mom. 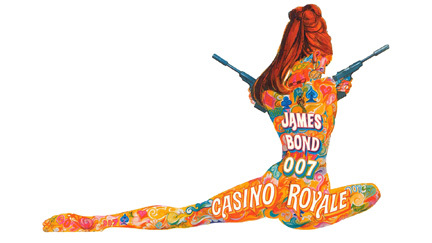 ﻿After all these years, Casino Royale is finally getting a proper cinematic interpretation. Although it was the first Bond book to be written, it's the latest to be adapted for the screen. The 21st to be exact. It promises to be more faithful to the book than the the farcical production starring Peter Niven, Peter Sellers and Woody Allen that was released in 1967. I doubt, however, that it will have a better score than the first adaptation to the silver screen… The Happy Medium Song of the Day is "Casino Royale" by Herb Alpert & the Tijuana Brass.